Writing a screenplay is a large undertaking. In not much more than 100 pages, a screenwriter must clearly and succinctly present a coherent and gripping story, complete with rich characters and interesting dialogue and action, all while following standard screenplay format. Get a feel for how they work. Screenplays are not stand-alone pieces of literary material. When you are writing a screenplay, you are writing a movie. Before you begin writing your first screenplay, you should get an idea of how words translate from the page to the screen. To help you accomplish this, read screenplays of some of your favorite movies, or find screenplays of movies you are less familiar with, and read and watch simultaneously or back-to-back. A simple web search will point you to some online script databases, but you want to be sure that what you are reading are the movies’ actual screenplays and not simply transcripts. The more scripts you read, the better you will be at picking out which are authentic, but a good starting place is on the library page at johnaugust.com, where screenwriter John August has posted multiple versions of the scripts for his movies Big Fish, Go, The Nines, and others. You will notice that all scripts share a common format. This is industry standard. 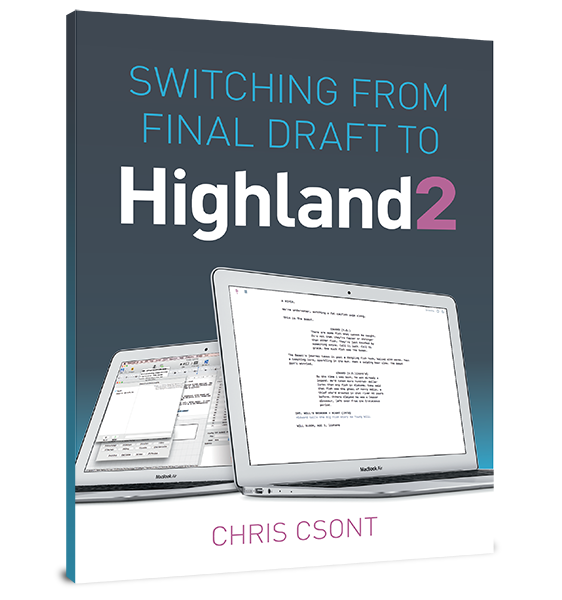 You are welcome to mimic the format on your own, but there is no need to: word processors like Final Draft, Celtx, Movie Magic Screenwriter, and others are specially made for screenwriting, and have the format built in. Let them do the heavy formatting lifting so you are free to focus on your story. Now that you know what a screenplay looks and feels like, you need an idea for your movie. Pick something you are passionate about. You will be spending a lot of time with whatever story you choose, and you will most likely have to fight through highs and lows. You don’t want to lose steam. Two tools writers use to help organize thoughts, and to accomplish and express this are treatments and outlines. A treatment is essentially a prose-version of your story, from beginning to end. Unlike a treatment, an outline is not typically done in paragraph form, and instead tells the story either through lists or bullet points. An outline can be more or less detailed than a treatment, depending on its purpose. If you are struggling with synthesizing your story, there are numerous books you can consult that may help you through the process. One favorite is Blake Snyder’s Save the Cat! Once you have the major beats of your story down, you may choose to get even more detailed and do a scene-by-scene breakdown of what the movie will look like. For some, this takes the form of another outline. Some writers choose to do this on a chalkboard or on notecards, with one card for every scene. Now, it is time to write. There is no set way that a screenwriter writes a screenplay; everyone is different. Some novice writers write after work every day for a year to complete a screenplay; other full time writers may be able to finish a draft working every waking hour until it’s done. Professional feature deals often will allow for a 12 week writing period for the first draft. But each writer is different. Take as long as you need, especially for your first screenplay. Write at lunch, when you first wake up, in the middle of the night, or all of the above. Open your laptop at cafés, your iPad on airplanes, or your notebook in bed. Just be sure you leave time to rewrite. Because as the cliché goes, writing is rewriting.